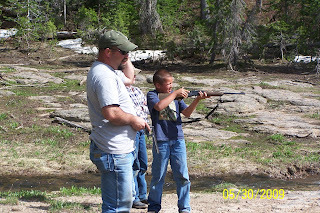 We attempted a trip up to Grassy Lake to take the boys fishing but there was to much snow. The road was still covered. So we stop to shoot guns instead. 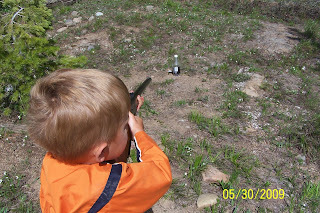 Kiowa is shooting a BB gun. Dakota had the best day he played all day with his friend Tel. Baseball in the morning, went to Tel's and rode horses , and then we took them to Grassy. That didn't end the day for them. When we got home they rode 4-wheeler, played video games, and then rode again. Oh, to be a boy! 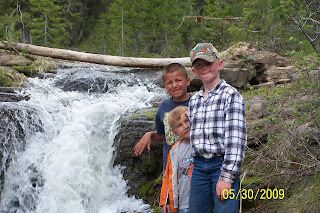 Dakota, Kiowa, and Tel by this waterfall after they had blasted everything the could. Ki was so proud he went by the waterfall all by him self. They had so much fun up there. Maybe next time the snow will be gone so we can get to the lake.